Can you imagine a series of emails generating $651,958.00? It’s hard to believe, isn’t it? This is the power of retention. And if it’ll work this well with this example, it’ll work for you too. Bradford Tax Institute delivers tax-saving strategies to members of the Tax Reduction Letter. How much do you enjoy working on your taxes? Exactly! This is a tough sell because most people 1) hate thinking about their taxes and 2) are paying someone else to take care of this so they never have to worry about it. Why would anyone ever subscribe to the Tax Reduction Letter? Murray Bradford’s information is different from anything else out there. All other tax-information services explain the law and how to comply with it. Murray Bradford delivers strategies for using the law to pay less in taxes. Murray’s strategies are so unique that few professional tax preparers know about them. When I went to use some of Murray’s strategies, I had to share Murray’s articles with my tax preparer so she’d be able to follow the law to implement the strategy on my behalf. Even though these strategies aren’t common knowledge among tax preparers, if you ask your tax preparer, he will tell you emphatically that he’s doing everything he can to save you money. Except he isn’t unless he’s also a subscriber to the Tax Reduction Letter, using the strategies for himself and his clients. This is no ordinary membership to sell. It’s a lot tougher. Professional tax preparers who could be great long-term subscribers already subscribe to other services and think they know everything. Then there are the taxpayers who hate dealing with stuff like taxes and thus trust others to take care of it for them. In both cases, you’ve got to get a person to go against their nature to subscribe to the Tax Reduction Letter. Murray sells online memberships primarily through an email-only seven-day free trial membership. He’s published thousands of articles online that get thousands of visits a day. To read the entire article, visitors have to take a free trial. Then it’s game on for Murray. He’s got seven days to convert this visitor into a paid subscriber. Since we implemented this new free trial conversions sequence, free trials have converted to paid memberships from an average of 16.65 percent to 19.21 percent. This is a 15 percent improvement. With the Tax Reduction Letter’s lifetime value, that increase in new members is worth $651,958.00. Pretty awesome, isn’t it? Murry asked me to help him create an email sequence to increase his conversion rate from email free trials into paid memberships. First I updated the free trial confirmation pages, and then I wrote a series of nine daily emails. Murray Bradford has a really short window to get his free trial members engaged and converted into customers. Most of these visitors landed on his website from a Google search for an answer to a very specific question. They aren’t looking for a new subscription to buy. Most visitors grudgingly enter their email for the free trial so they can get their answer. Then they plan on bouncing off the site to happily resume the rest of their lives. But for Murray, his opportunity is to turn this chance encounter into a long-term membership. A $651,958.00 bump in results. Not bad, huh? Good, because I’m going to tell you. Dan Kennedy taught me this lesson. Most membership marketers start with the belief that everyone in their market would love to buy their membership. When I ask, they are often hard-pressed to come up with any reason why anyone would NOT buy. Not me; I can quickly come up with a long list of reasons why your prospective members don’t join your membership. And if I have any trouble, I just ask them. Customers are happy to tell you what they don’t like about a product. To get started on these free trial conversions sequences, you’ve got a have a clear list of why someone doesn’t want to buy what you are offering. In Murray’s case, tax professionals think they already know everything about taxes, and taxpayers know they don’t want to know anything about taxes. No one woke up this morning hoping for the opportunity to subscribe to a tax strategy newsletter. I can’t tell you how many membership marketing campaigns people send me — some written by expensive copywriters — that wax eloquently about all the stuff you receive as a member. Notice I don’t talk at all about what members get. Nope, not a single deliverable is mentioned. Instead, I describe the transformation you’ll undergo by becoming a subscriber. In short, it’s transitioning from being a victim to being someone who is in control. Would you like to have more control over your membership growth rates? Well, then stop telling prospective memberships about what they’ll get. Instead, tell them how what they get will positively impact their lives. This is another Dan Kennedy quote. Too many free trial conversion email sequences wait until the end of the free trial to sell the member into buying a membership. I figured out in 2007 that there was a lot of money to be made by inviting members to opt out of the free trial, take action, and buy now. With this Tax Reduction Letter sequence, I begin including calls to action on day four. And when we start split-testing conversion, the first thing I’m going to test is including a call to action earlier in the sequence. I’ll often offer members a bonus for taking action before the end of the free trial. There are several features of the Tax Reduction Letter that are not available to free trial members. These features, properly promoted, create good leverage to encourage free trial members to buy a membership before the end of their trial. A bonus of taking action. What could you offer to incentivize your prospective members to take action and join? It’s always easier to do nothing. Buying your membership involves risk, trying something new, and possibly having to justify your actions. How can you make NOT joining your membership unacceptable? In 2004, when I first started using free trial memberships, I was taught to never mention the free trial. The theory was that if you tell people, you’ll just remind them to quit the free trial before joining. This was a myth. Yes, some members will quit. Heck, with Murray’s free trial memberships, 75 percent of his free trial members quit before joining. But by positioning the free trial as a benefit with a deadline to be taken advantage of, you have a better chance of getting your member engaged using the benefits you are delivering as part of the free trial. Many of the other emails in this free trial sequence mention specific tax strategies encouraging members to implement the strategy during the free trial so they can see how much money they’ll save. 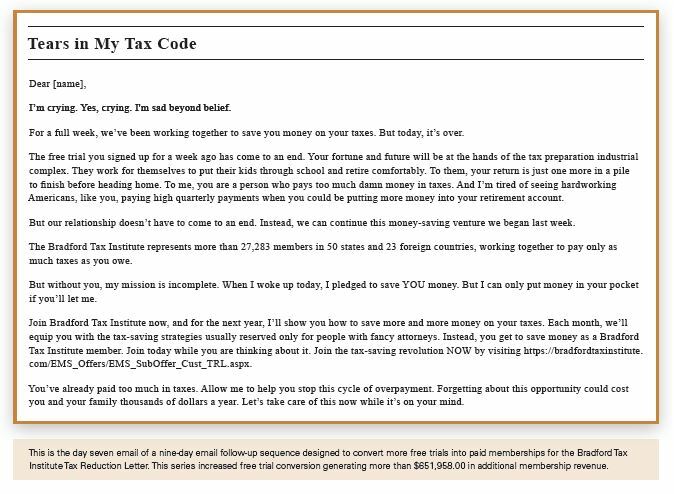 Rather than selling these emails, attempt to demonstrate the benefits of the Tax Reduction Letter. If you’d like to see the entire free trial conversion sequence, visit BradfordTaxInstitute.com and sign up for a free trial subscription. You’ll learn about converting free trials into paid subscribers, and you will also discover ways to save money on your taxes. And who knows — maybe you, too, will choose to become a Tax Reduction Letter subscriber! Thanks Robert for details and a sample of the Bradford email sequence to convert lookers into buyers. I will check it out on the Bradford website. I am sure the “tax tricks etc” will be different for the Australian tax office but I like the idea of being well informed to make sure we only pay the correct amount we are due to pay. I remember Kerry Packer making a statement to the Australian government that he didn’t think that they were doing such a good job of managing the tax dollars that he felt he should make any extra donations.All the best and thanks for your tips and assistance,they are much appreciated. John Barnett. Thank you so much for your comment. I hope you are enjoying your summer. It’s always great to hear from you.